Postcards from Home, an exhibition by Cresside Collette opens to the public on February 14 and will remain open daily until March 7 at the Saskia Fernando Gallery, 41 Horton Place, Colombo 7, from 10am to 6pm. 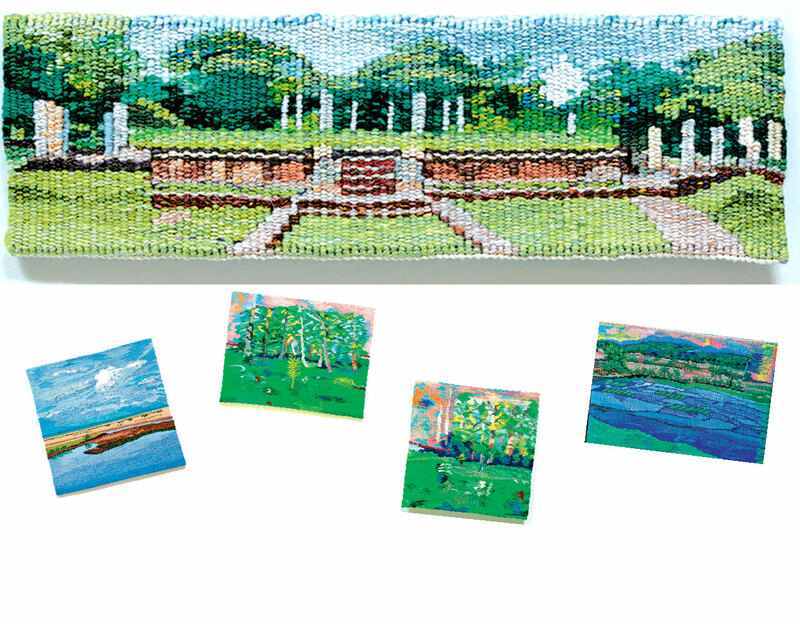 Born in Sri Lanka, Cresside Colette is the pioneer of en plein air tapestry and presents her first solo exhibition in the country this February at Saskia Fernando Gallery. ‘En plein air’ refers to tapestry of landscapes that are created ‘on location’ and the works from this collection are created in Sri Lanka as well as inspired by the Sri Lanka landscape. The En plein air works have been presented in a travelling exhibition across Australia, where the artist now resides. The larger works incorporate the Sri Lankan landscape with a combination of collage and pastel used as the base work off which the artist. Daughter of modern artist Aubrey Colette, of the 43 Group collective, this exhibition highlights the artists connection with her Sri Lankan origins. Cresside Colette was employed at the Victorian Tapestry Workshop in 1976 where she worked as a production weaver for fifteen years. Following this experience Cresside went on to complete her Masters in Fine Arts at Monash University in Melbourne in 2003. In 2003 and 2004 she was awarded residencies at Bindanon (the Boyd estate on the Shoalhaven River NSW). Cresside was finalist in the first Tamworth Triennale in 2011 and her current art practice examines the dichotomy of belonging to two lands, inspired by her return to Sri Lanka in 2009 to attend the Lanka Decorative Arts Workshop. “Every time I return to the country of my birth my senses are awakened to that familiarity, no longer foreign but an essential part of my being. I smell the ripe pungence of the air on arrival. The warmth envelops me in its stifling embrace. I hear the accents that surround me and I slip into the sing song easily, tailoring my own speech patterns to identify with them. The tastes have never left me – in 55 years my own culinary practice pays homage to the spices and techniques that bind me to this island. And above all, all that I see is imprinted on my psyche as I hungrily seek out the visual treasure that informs my art practice,”says Collette.